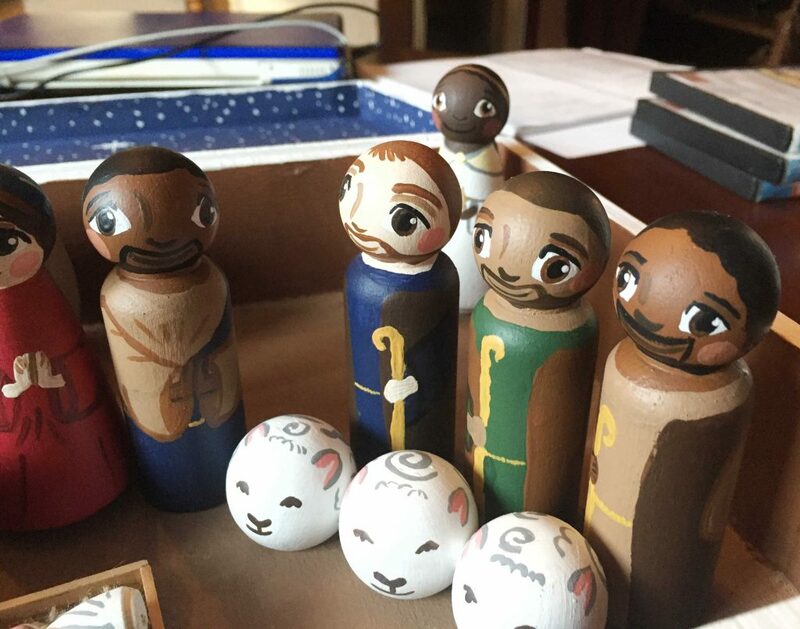 A few months ago, I spotted a peg doll nativity set on Pinterest. 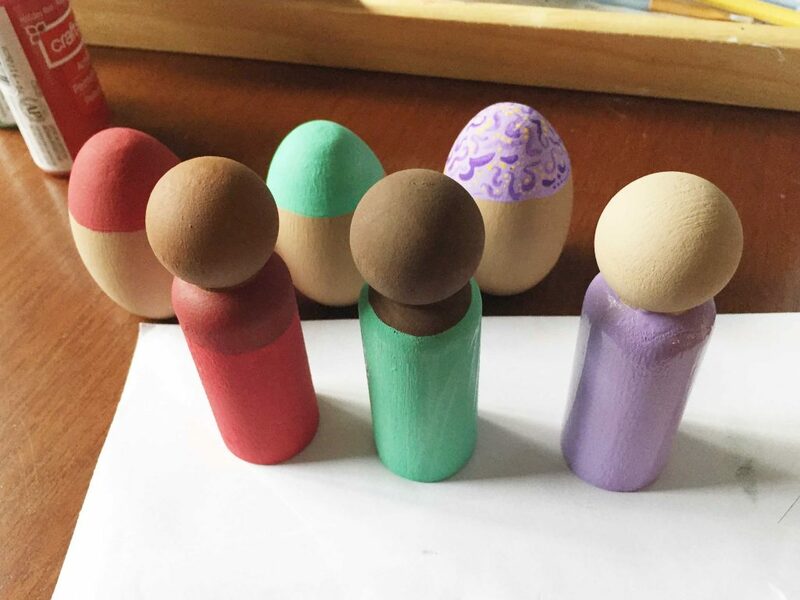 Peg dolls are simple wooden dolls that can be painted or etched to create sets for children to play with, or simply to display. 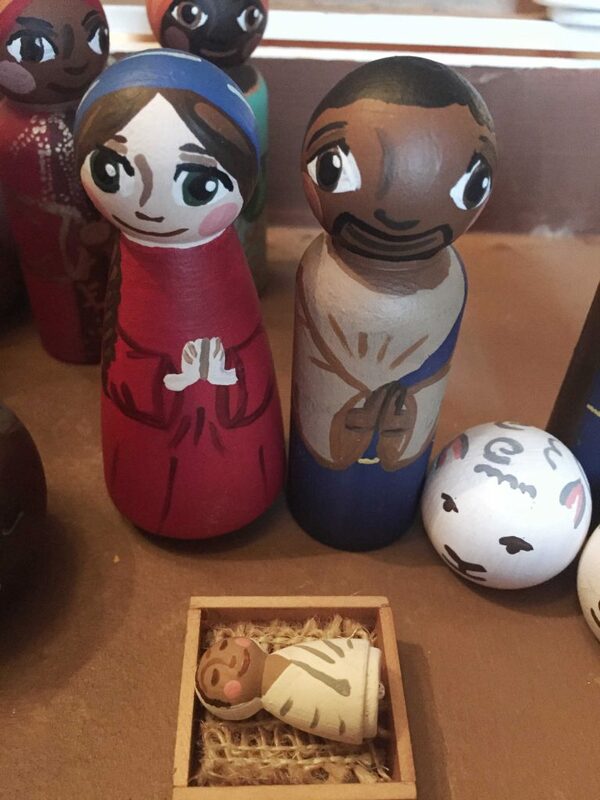 In recent years, they’ve become increasingly popular in Christian circles for Nativity or Easter sets. Once I saw the set online, I knew I simply had to make my own. It took me a few days and several bottles of inexpensive acrylic paint to do, but I am so, so happy with the results! 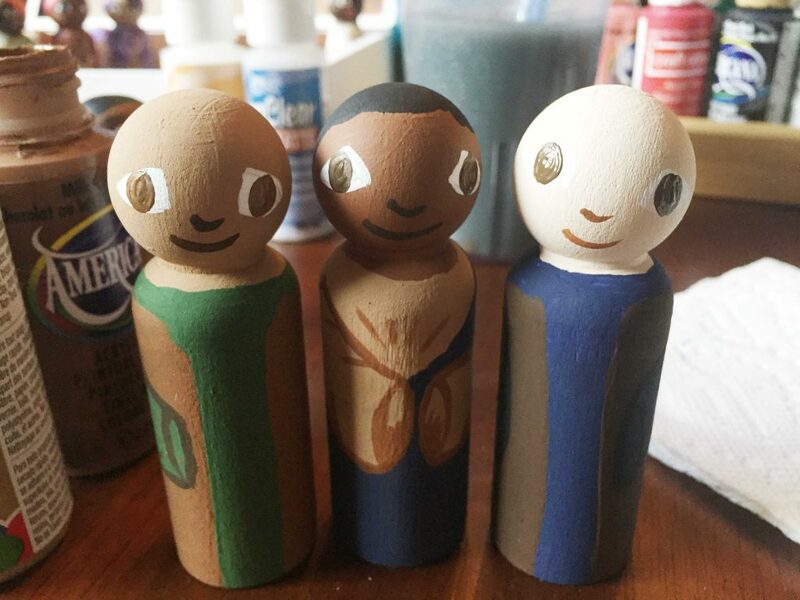 Today I’m sharing a tutorial on how to paint your own DIY peg doll nativity set. I’m no pro, but I loved this experience and had a great time putting this set together! 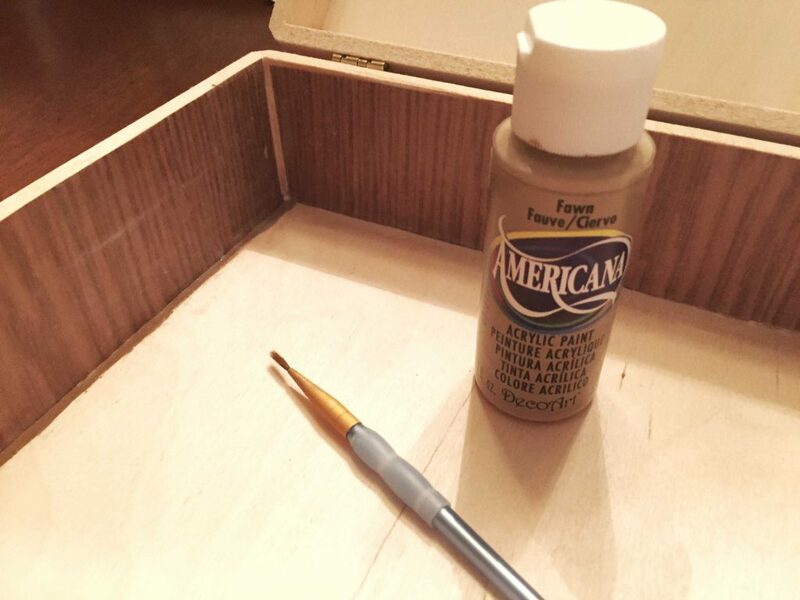 Acrylic paints – I use a variety of different ones that I’ve picked up over the years, but you can easily get an inexpensive set like this one. Varnish – I love, love, love this soft varnish, which makes the figures so nice to hold. It really does feel a little like velvet! 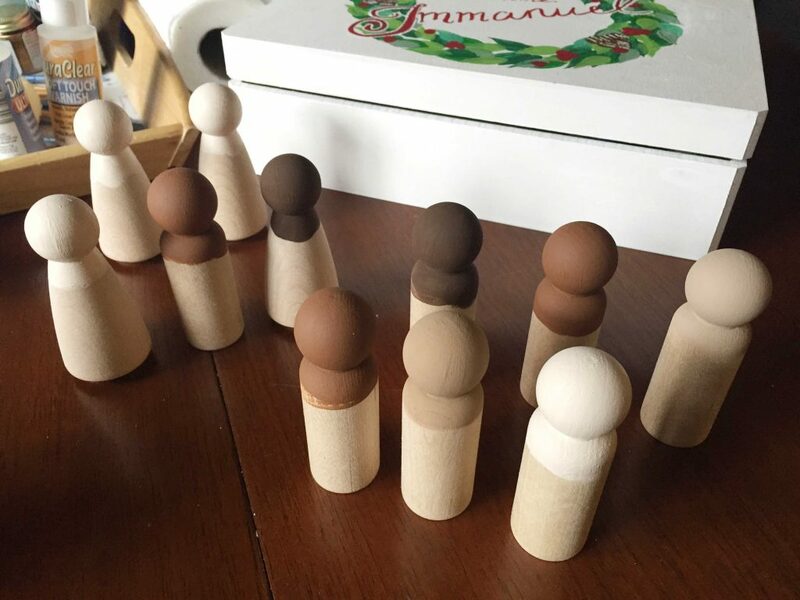 Male peg dolls – I got this set, and I love the shape and size! For Joseph, three wise men, and three shepherds, I ended up using 7 of the 10. Female peg dolls – These ones have a great size and a lovely rounded base. For Mary and the angel, I used 2 of the 10, and used the others for another set I made. 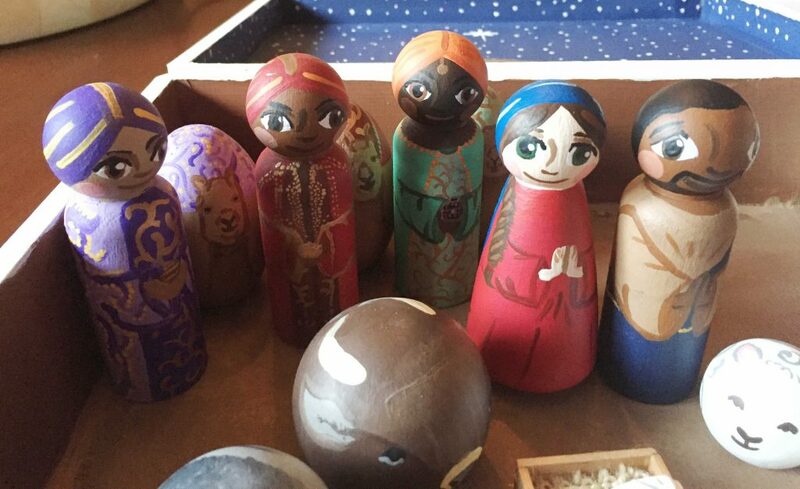 Baby peg doll – These should do the trick! 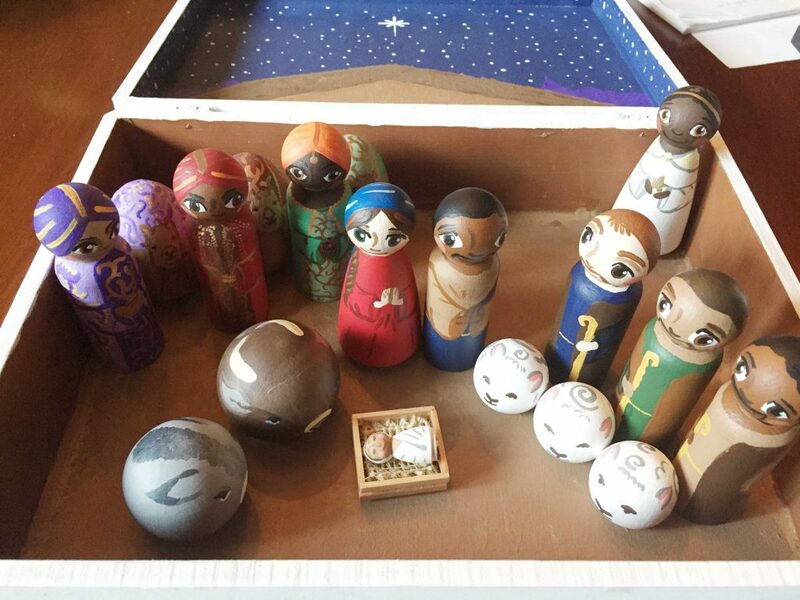 I began with the box that would house the nativity figures and also serve as the scene for the set. Using this basswood box, I measured the inside of the box and then cut a square from the ReadyGrass in the same shape and size. I then measured the inside walls of the bottom of the box, and cut pieces of the wood-like paper to serve as the walls of the barn. 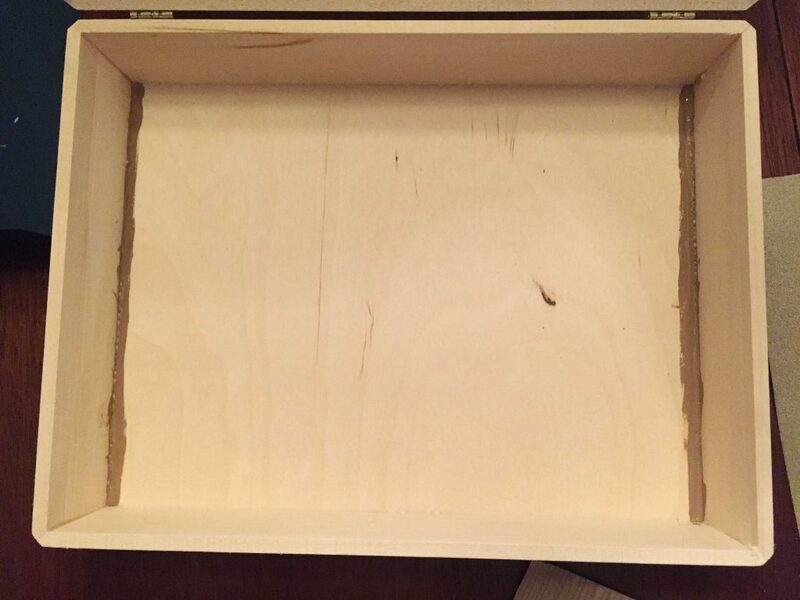 Next, I used a shade of brown paint similar to the wood to paint the seams, so that none of the basswood would show through. Then I used Modge Podge (you can substitute a 1:1 mix of Elmer’s glue and water) to glue the sheets of paper onto the inner walls. I then covered the “floor” of the box with Elmer’s glue and inserted the ReadyGrass. Now to the lid! I used a deep shade of blue to paint the entire upper lid. To make the roof of the barn, I used the remaining wood-like paper and cut a rounded shape the length of the inside of the box. 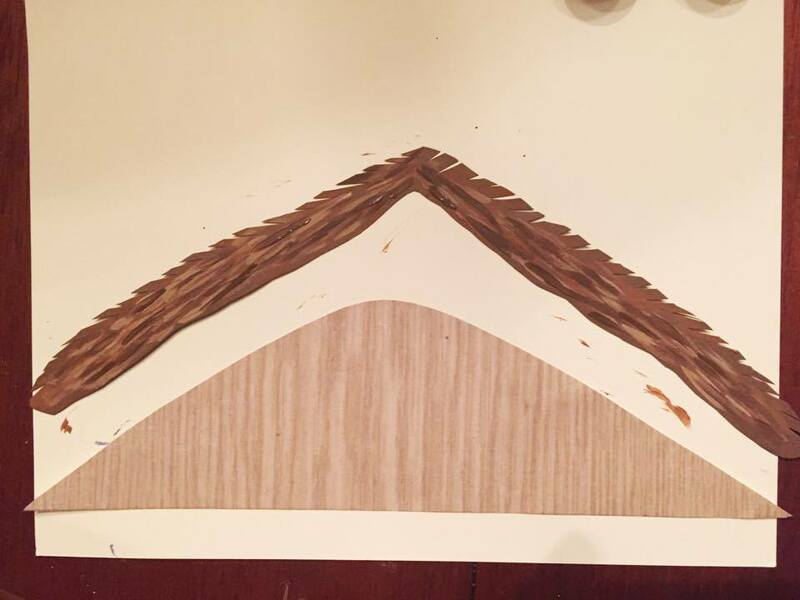 I also painted a thatch roof onto a different sheet of paper, in a variety of shades of brown. 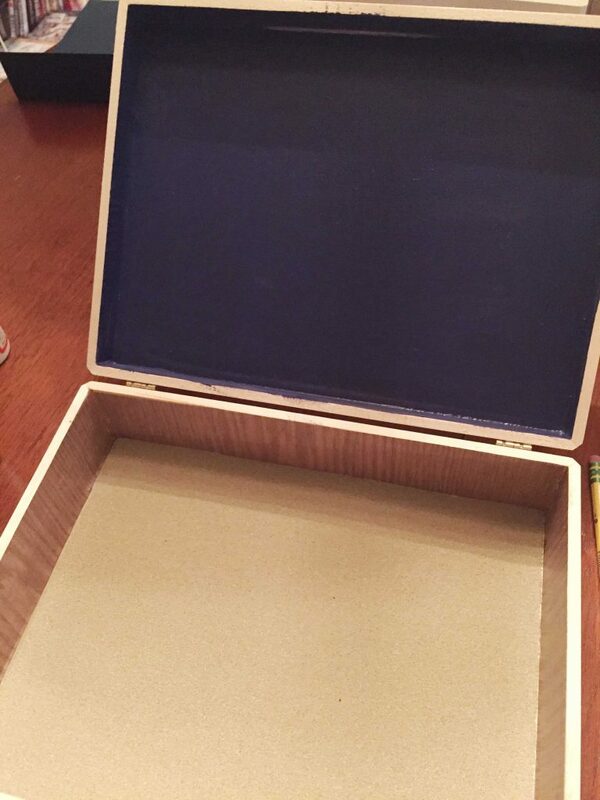 Using Modge Podge, I inserted the bottom piece of paper into the lid of the box. 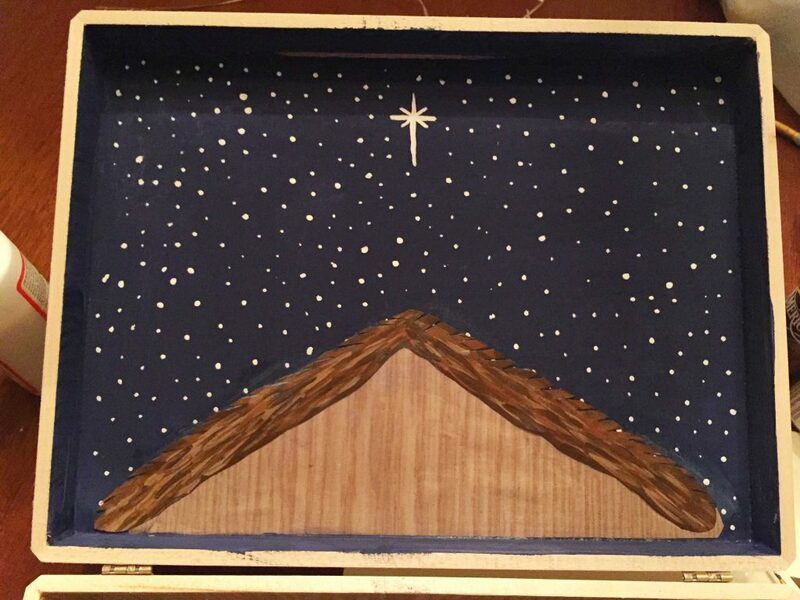 Then, using a white paint, I added little dots for stars, and one big star above the barn. After that, I used Elmer’s glue to attach the thatch roof. 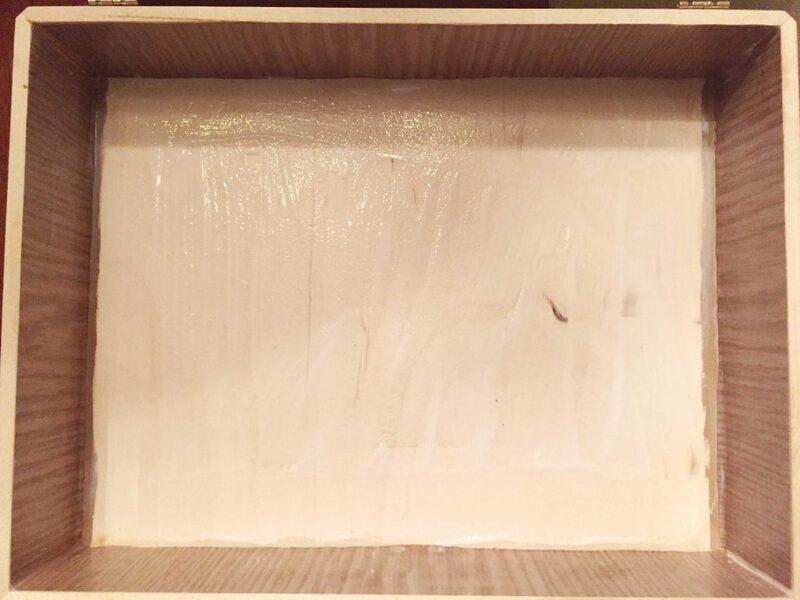 After the inside of the box had dried, I painted the outside a crisp shade of white. 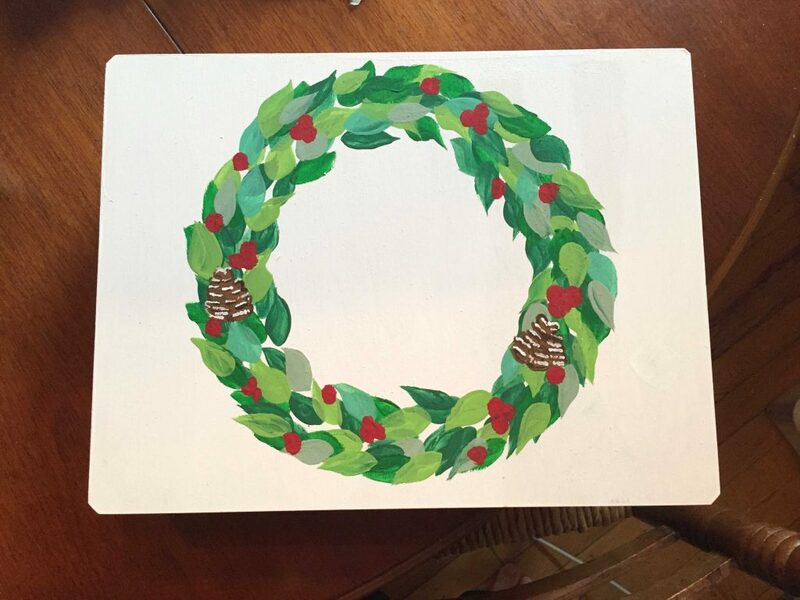 Then, using various shades of green for leaves and red for berries, I painted a wreath on the top of the box. 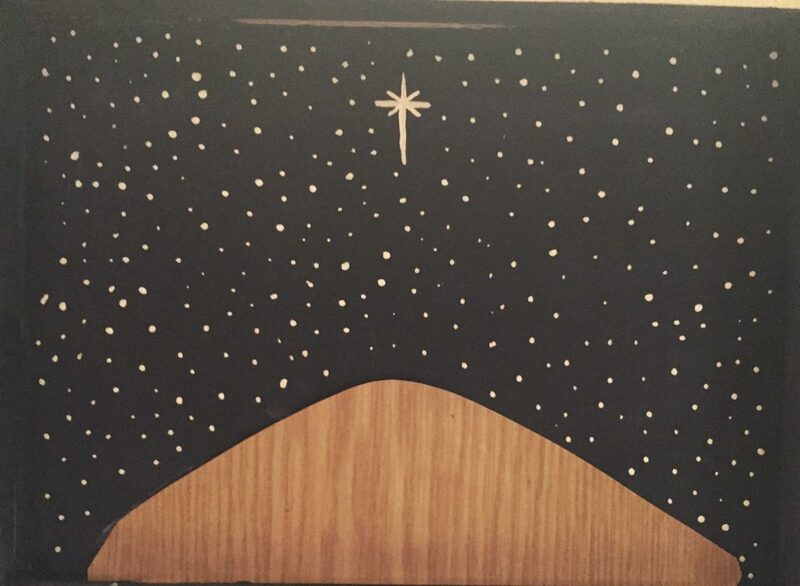 Using a pencil, I lettered the title of my favorite Christmas song, “Oh Come, Oh Come, Immanuel” onto the top of the box. 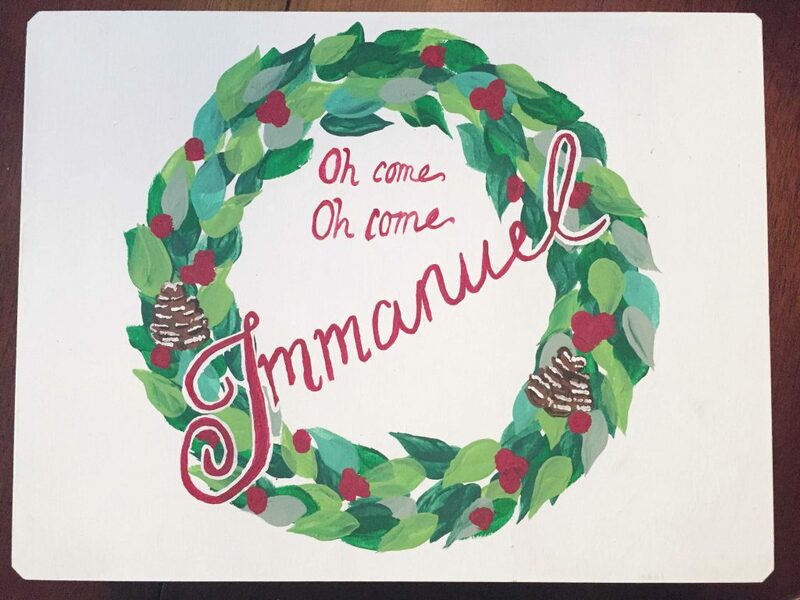 I then used red paint to letter the words on, and a little bit of the same white to create a border where the letters overlapped with the wreath. Finally, if you’d like the lid to stand up like mine does, just screw in two small eye hooks, and attach a thin ribbon between the two. 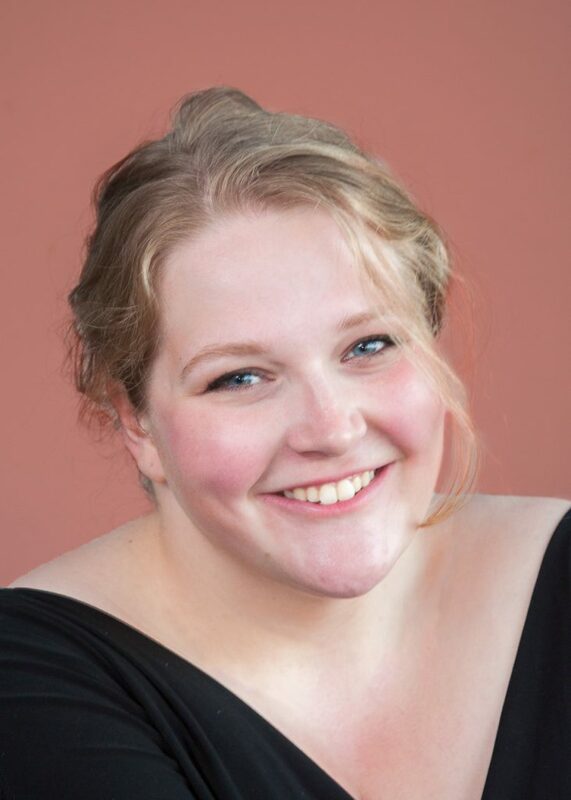 The full cast of characters looked like this. 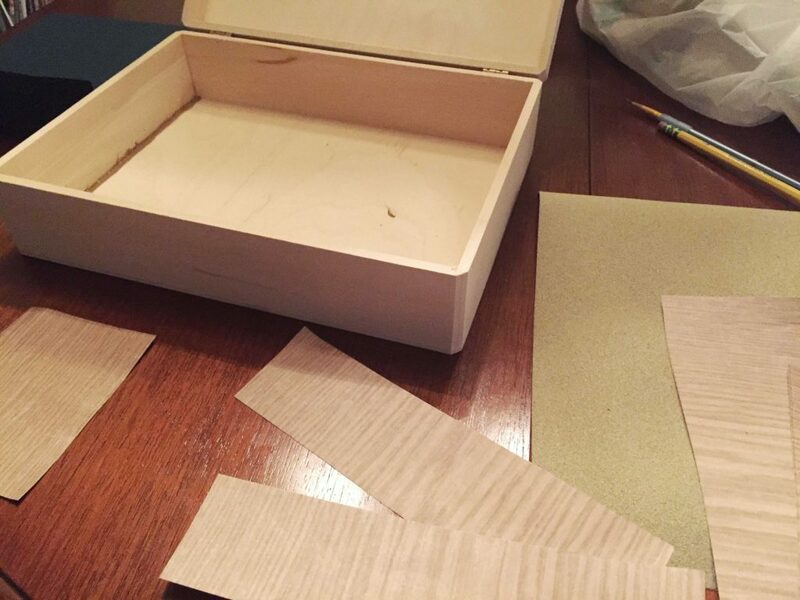 You may notice that this box is different than the one shown above; I painted two boxes, one for myself and one as a gift for someone else, and decided that I liked the method above better. Here is my advice for how to paint the figures as efficiently and nicely as possible. It’s best to start with skin tones for the figures, in my experience, rather than painting clothes and then skin tones. This way, you’re less likely to get bleed-over. Continue clothing your figures by adding layers upwards. Just as you put on socks, then shoes, and then tie your shoes, these figures need to be painted outwards for layering purposes. 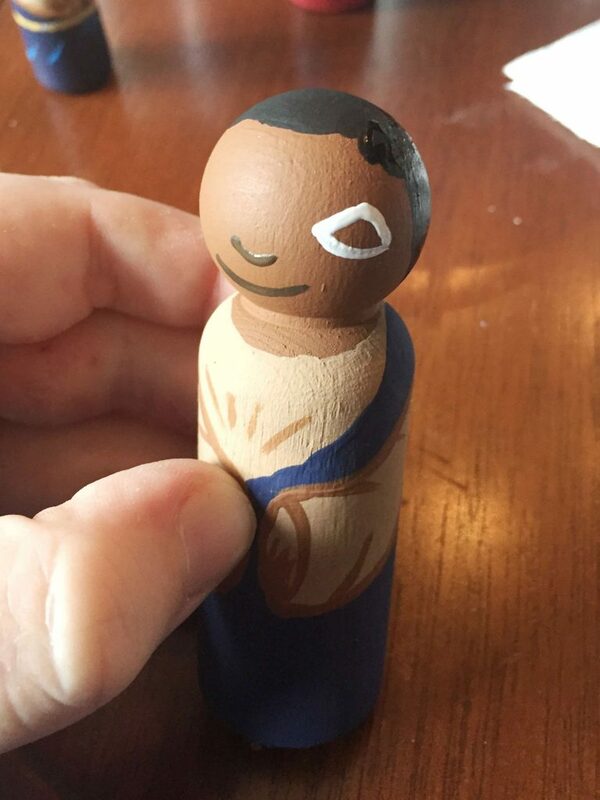 I looked at a variety of peg doll nativity styles online before deciding on how I wanted to style my figures’ faces. In the end, I came up with a friendly, wide-eyed look that I did by first painting the eyes, then the features, then the shading. 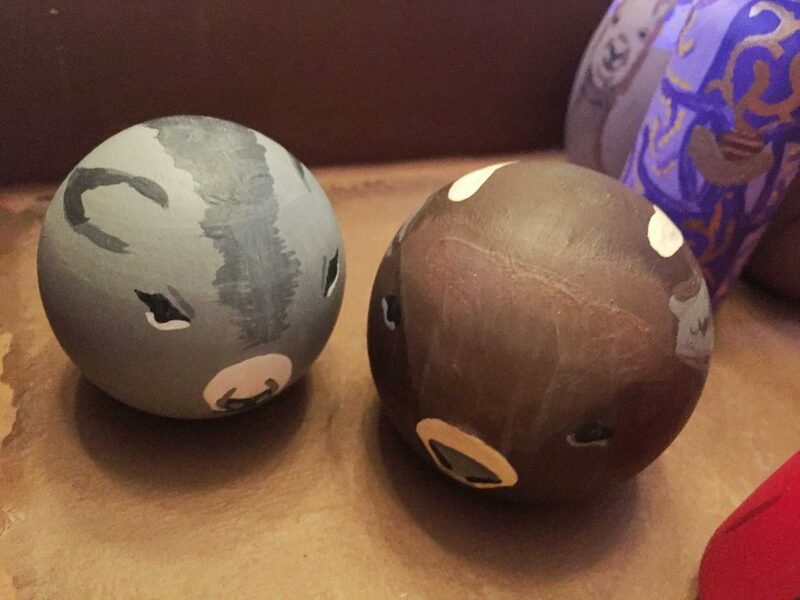 Make sure to varnish your creations and anything else you paint so that the paint doesn’t chip! When varnishing, do your best to leave an even coat so that you don’t get streaks. (I learned this the hard way, as you can see from my ox!). 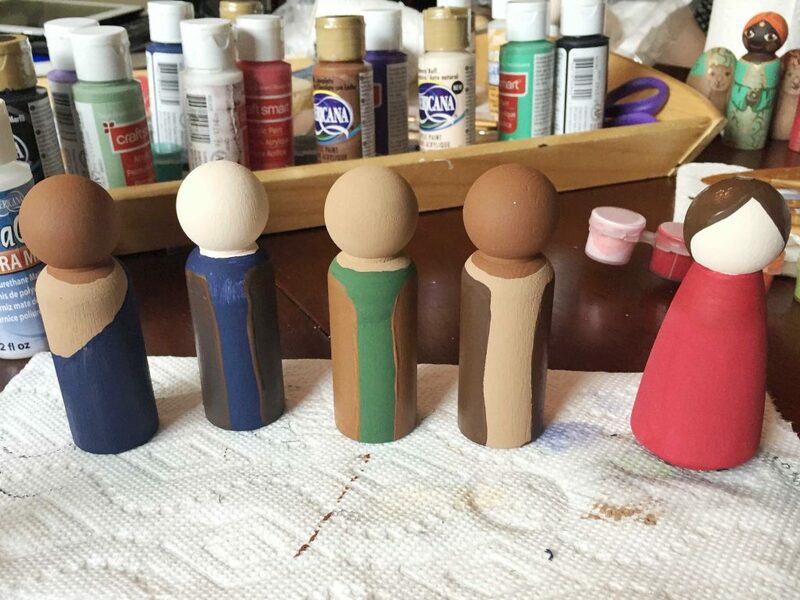 Have you ever made a peg doll nativity set? Would you? Which of these figures was your favorite? Soooooo cute, Sara! I especially love what you did with the top of the box! Love it! 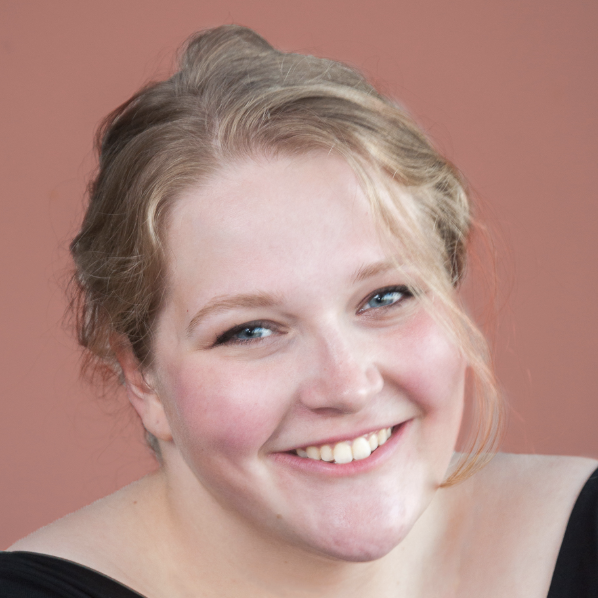 Thank you so much Katie! I learned from the best! Very cute, but you spelled Emmanuel wrong 🙁 Maybe you can still turn the I into an E? Hi RW! It can actually be spelled with both an I or an E because it comes from the original Hebrew. Thank you for commenting!